Fresh lobster tails on the grill are perfect for just about any occasion. However, cooking lobster tails on the grill requires careful attention to timing and movement. 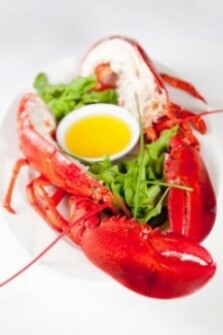 Cooking over the dry heat of a gas grill can dry the lobster meat out or cause it to cook it unevenly. Lobster tails on the grill should be rotated on the grill to make sure the tail meat cooks evenly. And the tails should be turned only once. Start cooking the lobster tail with the flesh side down. Then for the last three minutes flip the lobster onto the shell side. Split the lobster’s tails in half lengthwise and press the flesh open. Add the ingredients to a mixing bowl and stir. Brush the oil sauce onto the flesh side of the lobster tail. Pre-heat the grill to medium-high temperature. Place tails on the grill flesh side down and cook for seven minutes. Four minutes on the flesh side and three minutes on the shell side. Do not over cook. Remove the tails from the heat and serve immediately. As an option, garnish with fresh lemon slice and serve with grilled asparagus. Grilled fresh lobster tails; outdoor entertaining at its best. Tried this last night and the recipe came out perfect. Very easy to follow, and the lobster tails were a big hit.